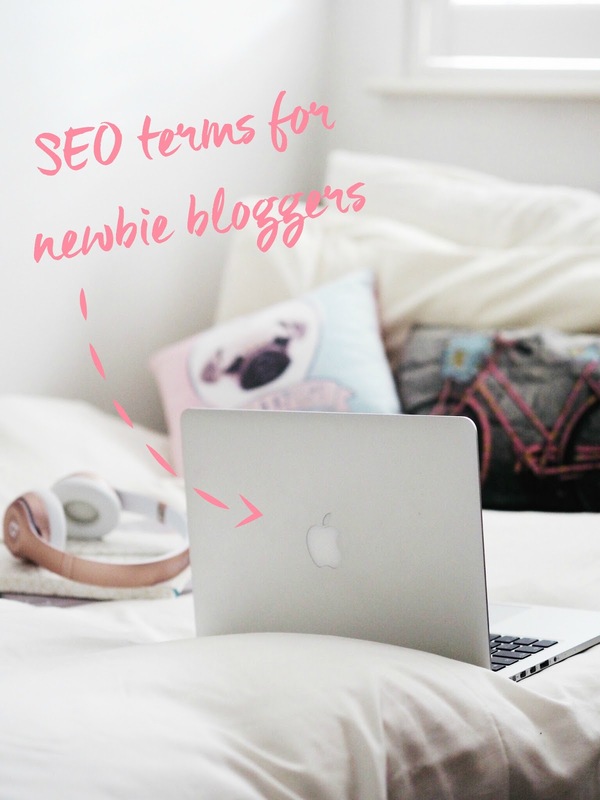 A few months back i didn’t even know what SEO meant, chances are if you’re new to blogging or you’ve just bought your domain you’re also being exposed to the minefield that is SEO for the first time. I’m no SEO expert, my DA is something that annoys me on a daily basis and there’s so much i still have to learn; but you can’t begin to learn about SEO without starting with the acronyms and terms that flood every single SEO article. (I mean i’ve already brought up 2 and we’re just in the introduction).. I want to cover the basic terms that appear when reading an SEO article but I’m just covering the basics here because lets be honest thats all i’ve managed to get my head around..
Well this is a good place to start isn’t it? SEO literally means “search engine optimisation”. If that’s still leaving you scratching your head i’ll break it down even further – See the word optimisation as maximisation so “search engine optimisation” basically means maximising your chances of getting your blog to appear in search engines. Thats obviously a very brief description because SEO is like the umbrella term and everything else comes underneath it, because SEO is about getting your blog to appear in search engines, within SEO there are then methods to enhance your blogs search engine optimisation. DA means domain authority, domain authority is how well your blog ranks on search engines on a scale of 1-100. For example if you have a high DA score of 90 and someone googles some of your keywords your blog will appear high up in the search results, most likely on the first page. However if your DA is much lower like a score of 1 its very unlikely that you’ll appear on search engines. There are many ways to influence your domain authority but i’m not going to go into them in this post because i want to make this as simple as possible, however you can check your own DA here. I will also add that you only have a DA score if you have a domain, for example you will not have an accurate DA score if you have a .Blogspot or .Wordpress address. MOZ are the people who created domain authority as a metric, when you go and check your DA score that score is calculated using MOZ’ metric. Thats an incredibly simplified definition but you can check out MOZ here. Backlinks are literally just a link from one site to another. Say if you’ve bought a product and you’re writing a blog post on it, its likely in the post you’ll provide a link to the product within the post – that is a backlink. A link from your site to theirs, but there are two types of backlinks which brings me onto the next terms..
DO FOLLOW: A link which counts towards your domain authority and will be counted when calculating your DA score. Basically it means that the link will “follow through” to your domain and be counted as a credible link to increase your Domain’s authority. All links are do follow by default. NO FOLLOW: A link which will not count towards your domain’s authority. When trying to calculate your DA SCORE a no follow link will be discredited and not counted. 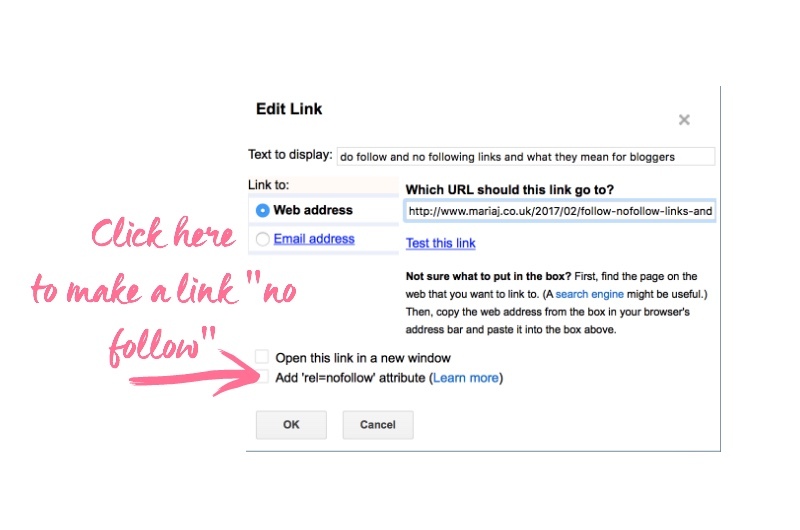 If you want to use a no follow link you’ll need to amend a link by adding a rel=no follow attribute. If you’re wondering when you should use each link i’ve written a whole post around them because they’re so hard to understand, so check out my post on do follow and no following links and what they mean for bloggers if you want to know more. 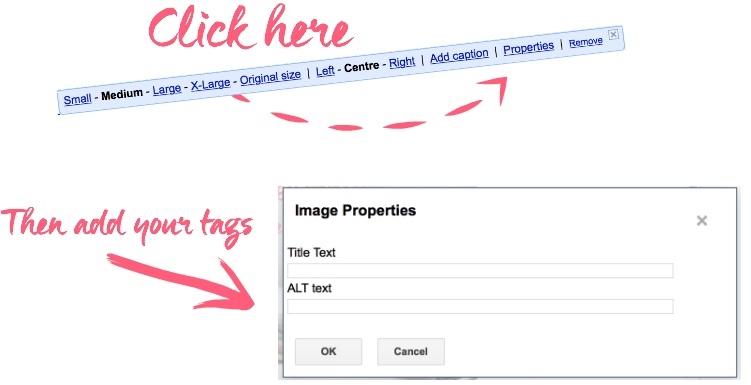 Alt tags are the tags you add to images so they can also be found in search engines and help your SEO. You can add alt tags to images in blogger by selecting an image in your blog post, clicking on properties and then adding relevant tags to your image. This way google has a written description of the image and will therefore know what the image is of, making it appear when someone has searched something relevant to it. For example if someone google image searches a product you’ve done a blog post on and you’ve added alt tags to your images they should appear and it may result in someone clicking through to your blog. Anchor text is the clickable text you use when adding a link, for example writing “you can see my blog post on it here” and linking the word here. However it is best to use actual words that describe what you’re linking to rather than just writing here, so if you were linking to my blog for example instead of writing “here” it would be best to write “MariaJ”. Again this all relates to SEO, even though you’re liking to someone else using original words instead of generic ones may influence your search engine optimisation. Okay we got through it, it wasn’t too bad right? I’m pretty proud of my limited knowledge of SEO, it just shows you how much you can learn through blogging. I hope i have answered some of your questions about the basics, even if your question was just “what the hell is SEO?”. If you have any more questions leave them below and i’ll try my best to answer them but if your question is about follow/no follow links be sure to check out the blog post i did on them! Great tips, I wished I could find something like this when I started. This was really useful, thanks a lot! I really struggle to understand SEO and what its all about, I know the basics but thats it – this was super helpful, thank you! This Is great! I started my blog a week and a bit ago so I really needed this!! Amazing! Thank you so much for this! Great read and so useful for those who are just starting out. Really useful to know Blogspot isn't included. It came up with 89/100 for my old blog and I started getting upset that I'd made the wrong choice switching to self-hosted. This has made m life so much easier!! Love this post, I am so clueless with SEO and I really want to start getting into it and upping my blog. Your post really helped me understand it! Wow thank you! I'm literally sitting here and reading every single one of your blogposts. They are helping me so much! THANK YOU! You've just explained everything I've been confused about, thank you so much for this!